Things that work for me. Homework was never easy or enjoyable at our house. Honestly, I kind of resent having to have anything to do with it (I did my homework back in the 1980s, I should be done by now). But alas, I’ve come to peace with the fact that my kids are not necessarily self-starters, and require some degree of parenting to keep them on track. This is especially the case when it comes to getting homework done. When the kids were little, at least the entire concept of homework was pretty straightforward: Here is a list of things to do. Now do them. All that changes in middle school, when suddenly the kids are faced with five or six different teachers, each with their own quirks and demands. It can be overwhelming for students, and exhausting for parents–especially if you’ve got more than one child. We are lucky that the school my kids attend, which runs from 6th through 12th grade, requires teachers to provide homework sheets for each class, each week. It’s a huge help for students to have the teachers articulate the learning objectives and assignments very clearly, and leaves no room for excuses such as not writing it down, or in my son’s case, not being able to read what you wrote down. Still, with five or six different teachers handing out just as many homework sheets, there’s just a lot to sort through. My kids are getting better at doing their work, but they’re still struggling with the executive function portion of the equation–that is, figuring out what they need to do, when, and how to prioritize lots of competing tasks and activities. So, I’ve found that the best thing to do is for me to sit down at the beginning of each week and sort through all the assignment sheets and the family calendar and synthesize a weekly list for/with each of them. Making that weekly list into a visual chart is even better, allowing kids (and parents!) to clearly see what assignments are coming up, and spot potential roadblocks in advance, so the kids can address them with teachers, coaches, and guidance counselors long before deadlines start rearing their ugly heads. Enter the Homework Map. 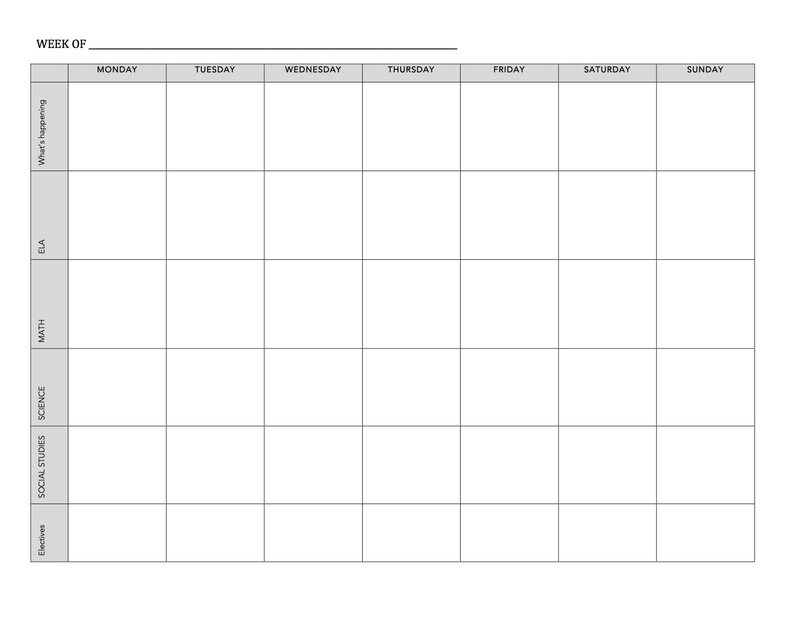 It’s a simple chart, similar to a weekly planner but customized for school work. You can buy a planner that does the job for them, but I’ve never found one that works perfectly. I find it easier (and cheaper) to just work with this simple MS-word document, which I print out and fill in in pencil. You can click on the links below for a pdf file that you can print out, or to download a Microsoft Word file that you can customize however you like. Use it with your homework sheets–not in place of them. Make a quick note of what needs to be done in the cell for each subject. You don’t need to go into detail–just note the general gist of each assignment (for example, “Read and answer 5 questions”) and refer to homework sheets (or your teacher’s website or whatever) for specifics. If the kids don’t get assignments in advance, just have them fill it in as best you can as they move through the week. Oh, and start nagging your school to start posting the assignments to the web or via email. It’s 2014, for God’s sake. Use the “what’s happening” section to track after school activities. Jobs, service commitments, family obligations (including babysitting younger siblings), sports or clubs may be competing for students’ time after school. Be sure to schedule in all of these commitments so kids can factor them in when planning their time. Seeing it all in one place will help them to visualize how how much time they really have to tend to homework, so they can adjust their schedule as needed. Plan seven days–or even two weeks–ahead! If Monday to Friday are looking kind of busy, kids will see it–and may want to get ahead on next week’s assignments over the weekend. One of the reasons I hate most weekly planners is that they include only a tiny section for weekends. Students who do a lot of activities may want to use some weekend time to catch up or get ahead–so factor that into the map. Set benchmarks for big projects. If a student has a big project due on Friday, he or she can break it up into smaller tasks over the course of the week, and do a little each day. Setting firm benchmarks is a fantastic way to approach large projects. For example, rather than just writing “essay due friday,” take a few minutes to figure out individual steps and plot them on your map. For an essay with a deadline that’s a week away, your map might include daily benchmarks for researching, outlining, identifying evidence, writing the body, the intro, and the conclusion, and revising/finalizing the essay). Busy day? Tweak the schedule. If a child sees that they’ve got a ton of homework on Wednesday, plus two hours of team practice after school, they might want to move some tasks from Wednesday to Tuesday, or talk to their coach about cutting out early if they have too much work to do. Prioritize work vs. leisure. If a child sees that they’ve got a ton of homework, they should know that it’s not in their best interest to turn on the TV when you they home. Remember Newton’s Laws, and stick to the Momentum Optimization plan! Schedule your fun time, too. On the other hand, if you KNOW your kid is going to want to watch the big game (or in our case, this week’s Face Off ) on a particular night, go ahead and put it on the map. That way, they’ll know they need to get their work done earlier in order to have it out of the way when prime time rolls around. Make it a team effort. My goal isn’t to organize my kids’ lives for them–it’s to teach them to organize their own. I’ve learned with my son that sitting down with them and making the map, and then checking and adapting it each day as we move through the week makes the worse less daunting for him and less stressful for all of us. With my daughter starting middle school this year, I’m glad to have the system in place already and hope we can get her started on developing good habits right away.